It's funny, and it's got that Sun style. 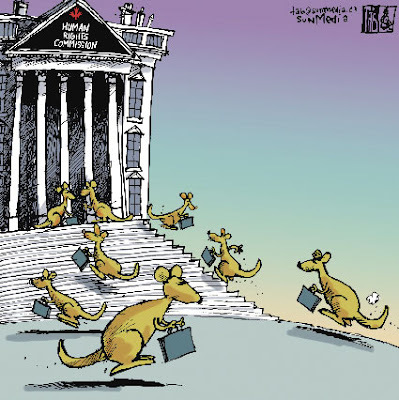 But the reason I like this cartoon so much is that the cartoonist who drew it, and the editor who approved it, both decided that the subject of the abusive and corrupt practices of Canada's human rights commissions are so appalling -- and that enough of the Sun's readers were now at least vaguely familiar with that fact -- that this cartoon was appropriate. Cartoonists don't draw for themselves; they draw for their readers; they draw with the news in mind. Their job is like an opinion columnist, but they use a picture, instead of 1,000 words. Six months ago, this cartoon would have been met with a collective "huh?" both by the Sun's editors and readers. Not now. Now it's met with a collective "ha!" Enough people know about the corruption at Canada's HRCs; enough people are outraged; the case has been made; the denormalization of these commissions is well underway. I think it's a good cartoon. But the fact that it was even published is my favourite part about it.